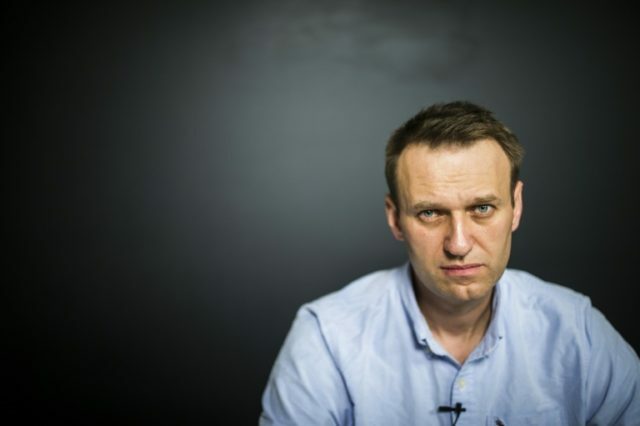 Moscow (AFP) – Russian opposition leader Alexei Navalny, who has declared his intention to unseat Vladimir Putin and to run for president next year, was detained on Friday ahead of a rally, in the latest attempt by the authorities to thwart his campaign. The 41-year-old Kremlin critic was leaving to get a train to the provincial city of Nizhny Novgorod to hold a rally at 6 pm (1500 GMT) on Friday when he was detained in his building’s entrance hall in the morning. “I’ve been at a police station for three hours now,” he later said on Twitter, adding he had not received any explanation for his detention. “I am sitting in a reception room and looking at a portrait of Putin,” he said. The charismatic anti-corruption crusader has said he wants to stand for president in next March’s polls, but the electoral authorities have said he is not eligible because he is serving a suspended sentence for fraud. Putin, who has led Russia since 1999, is widely expected to seek and win another six-year Kremlin term. The campaign has yet to officially open. The Nizhny Novgorod authorities said they have refused Navalny permission to hold the rally but his supporters have vowed to go ahead anyway. Navalny also linked his detention with another – bigger — rally scheduled to take place in Russia’s second city of Saint Petersburg next week. “The Kremlin sees my meetings with the electorate as a huge threat and even an insult — after all no one goes to their rallies without being paid,” he said. He called on his supporters to show up at the rally in Nizhny Novgorod anyway. “Come for the sake of principle and as a sign of protest against the stupidity, senility and degradation that have overtaken our country,” he wrote. Undeterred by the seemingly predetermined outcome, Navalny has pressed ahead with his presidential bid and travelled around the country to rouse his supporters. After he declared his bid he suffered a new wave of legal obstacles and attacks and even had to travel to Spain for eye surgery after one of the attacks left him nearly blind in one eye. Navalny has been gathering crowds of supporters across Russia, seeking to shift public attitudes and battle political ennui in places such as the Pacific port of Vladivostok and other cities. The Russian justice ministry accused the Council of Europe of putting political pressure on Moscow ahead of the elections. Navalny was detained before he even arrived at his last two rallies in Moscow on March 26 and June 12, both of which were not authorised by the city hall. He served sentences of 15 days and 25 days in police cells for organising unauthorised protests. Political observers say that the growing atmosphere of intolerance towards dissenters has prompted a surge in radical feeling in Russia as verbal threats from Kremlin supporters give way to physical attacks. Many have applauded Navalny — whose ally Boris Nemtsov was assassinated in 2015 — for his decision to keep up the fight at a time when many have chosen to leave the country or stay quiet.